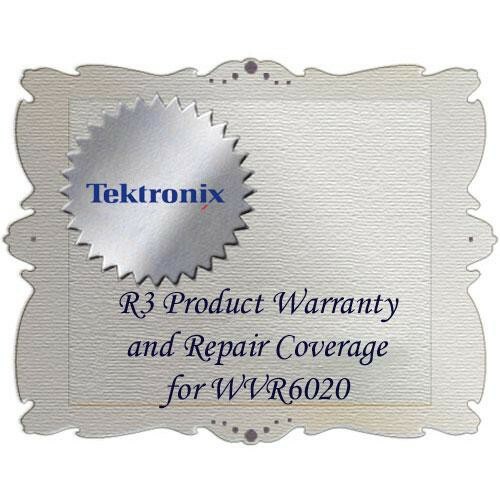 The R3 Product Warranty and Repair Coverage for WVR6020 from Tektronix is a service option available for the WVR6020 test instrument that provides (3) years of coverage. Please note that this specific warranty must be purchased at the same time of your equipment purchase. Purchasing a special service plan for your unit can lower your total cost of ownership and minimize downtime. This plan can be an extremely economical solution for unforeseen future repair and service issues. Once your equipment is covered by it, you are only a phone call away from starting your repair process without the hassle of quotes, purchase orders, or approval delays. Your device will even receive priority in the repair queue at the depot ahead of on-demand repairs. Online tools are also available to book your repair order and track its progress. Moreover, service depots are available around the globe. Because this warranty is provided by the original equipment manufacturer, your device will be returned to you in like-new factory performance condition. At the time of service or repair, your instrument will also receive the latest firmware updates and safety modifications. All repair work includes calibration and adjustments to restore published accuracy specifications, ensuring measurement results can be trusted. Calibrations are performed under an ISO 9001 Registered Quality System and in compliance with metrology standards, including: ISO/IEC 17025:2005, ANSI/NCSL Z540.1-1994(R2002), and ISO 9001. Take advantage of this extended repair & service coverage to lower your total cost of ownership, minimize downtime, and guarantee that your equipment continues working despite unforeseen problems.